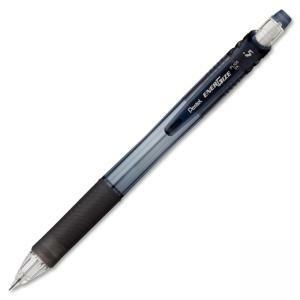 Mechanical pencil includes stay sharp lead inside that is equivalent to a no. 2 pencil lead and never needs sharpening. Comfortable latex-free grip and barrel design make it a great pencil for everyday use. Color-tinted barrel with curved clip design allows easy monitoring of lead supply. Cap conceals and protects eraser from contamination. Refillable with Pentel Super Hi-Polymer lead.